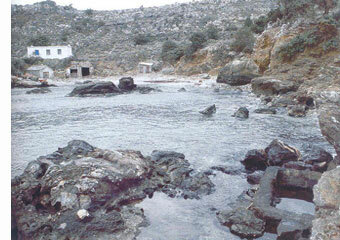 The ancient springs-town of Ikaria was buried after a landslide. It was on a peninsula 300 meters east of where Therma is today. As the findings prove, there was a settlement and organized facilities for the bathers about 2500 years ago. Today all that survive are ruins of a small part that remained on the surface and some buildings dating from the Roman Period. Several springs pour into the sea. One of them is still being used today. That's Loumakia. Loumakia is just on your right side if you're in Therma and not facing the sea. The path begins at the "Agriolykos" boarding house. You follow the green arrows and you'll get there in 10 minutes. If there are no waves, you should dive in. It's a nice place, with beautiful rocks. The water is about 104o F.
The hot springs of Agia Kyriaki used to be housed in an abandoned building (today) with four basins. Hot water still pours from the building and it gathers in a "basin" in the sea. From Agios, following the seashore. The gulf of Agia Kyriaki is next to the airport. Rumor has it that the water causes weariness and dysthymia. That's not even remotely true, though. The water is amazing, the gulf is not windy at all and there are no waves.